There will be a parade of five retrained racehorses prior to the running of Saturday’s Sir Peter O’Sullevan Memorial Handicap Chase (1.20pm) at Newbury. The line-up features four Grade 1 winners, including Sire De Grugy, plus a winner of the Hennessy Gold Cup, now the Ladbrokes Trophy, in Carruthers. The parade will commence at around 1.00pm during racing at Newbury this Saturday, December 1, day two of the Ladbrokes Winter Carnival. The RoR horses will lead the field out on to the racecourse and appear in front of the stands while the runners go to post. The 2014 Queen Mother Champion Chase winner Sire De Grugy is making his first appearance in a Retraining of Racehorses parade. He is joined by prolific winners Annacotty, Carruthers, Melodic Rendezvous and Zarkandar. All five horses are enjoying a second career after retiring from racing. 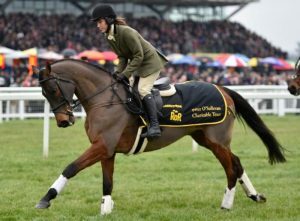 The Peter O’Sullevan Trust is a valued supporter of Retraining of Racehorses (RoR), British racing’s official charity for the welfare of retired racehorses, and the Trust is the official sponsor of RoR’s racecourse parades. The parades promote the versatility of former racehorses and their suitability for a range of careers after racing. During the summer, Sire De Grugy spent a few weeks at RoR’s flagship yard at Palace House in Newmarket, where the gelding underwent some retraining and proved a big draw for the public. Since then he has been enjoying his retirement at trainer Gary Moore’s yard in Sussex where Jamie’s wife, Lucie, often takes him out riding with their children. Like Sire De Grugy, both Zarkandar and Melodic Rendezvous are relatively recently retired from racing and are still acclimatising to a slower pace of life. However, both have settled well into their new routines and are set to enjoy several days out hunting this season. The 2015 Paddy Power Gold Cup winner Annacotty has adapted very well to his second career, competing in a range of disciplines and classes, from showjumping to showing, and even being ridden side-saddle. The long-term aim for him is to compete in open working hunter classes, following some success in RoR-run classes this summer. The victory of Carruthers in the 2011 Hennessy Gold Cup provoked some memorable and emotional scenes. The horse being owned and bred by the late Lord Oaksey and his family, and trained by his son-in-law, Mark Bradstock. Since retiring from racing, Carruthers has enjoyed a busy and varied life, from leading the field out drag hunting to giving small children rides around the school at Mark and Sara Bradstock’s yard at Letcombe Bassett, close to Newbury. He has also been a school-master for point-to-pointing, teaching Lily Bradstock, who rides him in the parade on Saturday. Di Arbuthnot, Chief Executive of RoR, said: “We are very grateful to the Peter O’Sullevan Trust for their on-going support of the charity and in particular their sponsorship of our racecourse parades. Harriet Collins, Head of Communications, Newbury Racecourse, added: “For the second year, we are delighted to be welcoming the 2011 Hennessy Gold Cup winner Carruthers to Newbury on Saturday along with a number of other familiar faces.